PBB’s indulgence into racist and religious politics should be stopped! 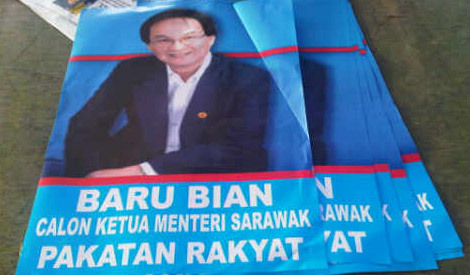 Baru Bian is portayed as a threatening candidate for muslim voter-most despisable racist campaign tactics! It has been reported that the above poster has been used to scare Malay/Melanau & muslim voters-who largely are PBB’s `safe deposit’, of the prospect of being ruled by a minority ethnic person and by a Christian. Such propaganda is probably working over time in rural areas where Malays/Melanau are predominant. It is unfair as an election tactic: Taib himself has frequently claim to represent all ethnic groups in Sarawak despite coming from a minority Melanau ethnic group. No one dispute his claim-they only dispute his mis-rule. Not his ethnicity! However his campaigners are claiming that another Sarawakian is not entitled to rule over Malays/Melanaus just on account of his ethnicity and religion. Preferaly an open debate is held to clarify the issue-however the side holding the propaganda tools are not coming to the table. They would rather work behind everone’s back to push the dirty politicking by abusing ethnicity and religion. on account of this there is a need for the public to speak out that they have no problem with working with any capable and impartial leader-with no consideration to ethnicity and religion. Freedom of campaign in jeopardy! There are a few ways where freedom to campaign have been jeopardised in the Sarawak state elections: 1. Long houses are stopping Opposition parties to campaign-cutting off the info-poor residents from getting information from all sides; 2. Some campaign by the opposition are stopped on account of not getting police permit-even though the party which refused to give permit in the first place is the police themselves; the police don’t think that they need to prove their suspicion of any threat to security to anyone-thus making it possible and likely for partisan consideration to come in ; 3. Stopping the coverage of religious issue specifically the Malay bible issue and the ban over the word `Allah’ for Christians; While the Sarawakians Christians are given exception they are told that their fellow co-religionists in the West Malaysia are stopped from using the word. Meanwhile the Chief Minister try to credit himself by saying that he was the one to stop the printing of serial number on the Malay bible-saying that it is `stupid’. It is not difficult to see that he is trying to gain political brownie point for himself-but at the same time isn’t he giving himself an exception to discuss the religious issue that everyone have to avoid? Lastly the police and the military are beyond accessiblity by the opposition parties. Only the incumbent can campaign to them-causing over 90% of these postal voters to vote the incumbent parties! 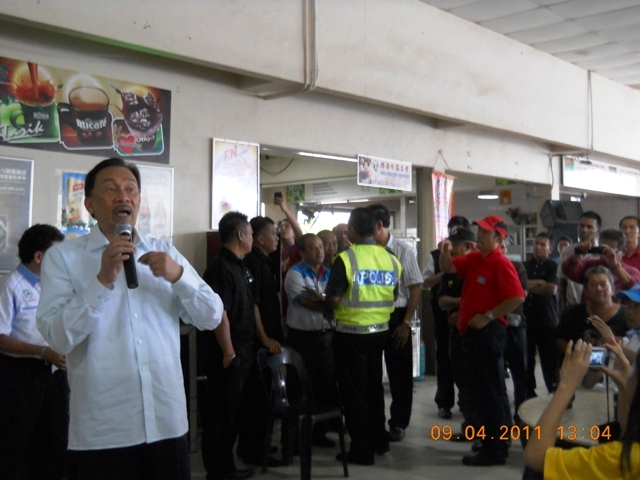 Anwar stopped by police at Niah junction-in the middle of a campaign period? The police seems to be able to smell Anwar from far away..
Are the police being people-friendly or only BN friendly? 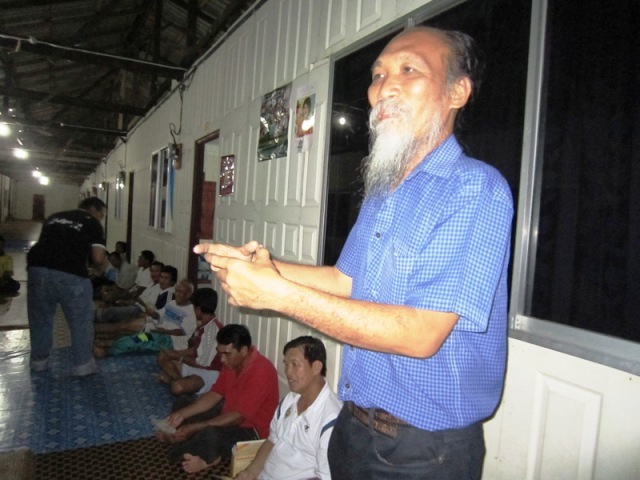 BN’s Cy-war stopped Sarawakreport, Radio Free Sarawak web site & Dayak Baru? The `secret weapon’ of BN seems to have been unleashed: popular anti-Taib web site Sarawak Report and Radio Free Sarawak web site are out of reach to readers for the last few days, and a Dayak blog Dayak Baru show a notice `This account has been suspended’. These web sites have been the main conduit of information critical to the ruling parties. Instead of rebutting the arguements and reports from the web site-the power that be seems intent to just shut them up! The voters are left none the wiser without any rational and intelligent debate. Taib has recorded a few videos to put up his side of the story-which some how fell flat to be convinsing. Eg he claimed in 1 of them that he does not stay in any lavish house-while the setting to the recording is something like a 5-star hotel! MEO-Net's training at Rh Lingga 2 weeks ago-but now the house is off-limit to observers! The area where 14 villagers are affected by logging in a disputed areas is reported by our observer as arather quiet place where dissatisfaction may just hide below the inscrutable surface. There are numerous BN flags, posters and banners which overwhelmed the Opposition’s , reflecting the omni-presence of the incumbent party in Sebuyao. The quiet surface however produce a 1000-strong gathering ahead of a court hearing of a local Numpang Suntai who was charged for criminal intimidation after some equipment, vehicles and quarters were burnt after a bloakade. In the hearing the accused was released-but the police is appealing. The sentiment of these largely Iban residents affected may not be reflecting the ground sentiment among the majority muslims community. There is a PAS compaigning contingent here, supporting their candidate who fight here for the first time. Mat Kati Seman the blogger noted during the Perak crisis is among them. Police deny freedom of campaign? Reports are coming out that the police are holding back permit for campaign by the parties especially when the campaign activities appear to be capable of attracting big crowds. This definitely deny freedom of campaign to the parties/candidates involved-which inevitably are the Opposition parties. The police as part of the election administration units should be impartial in carrying out their job-especially after they give themselves the right to issue permits for gatherings even when the official election campaign period is on. They must exercise their power fairly and rationally. By giving excuse that the bid gatherings will create traffic jam the police are exposing their incapacity to control traffic, on the 1 hand, and their partisan stand on the other. Do they only give permit to BN’s smaller gatherings? So far 2 DAP gatherings in Kuching last night was denied permit at last minute by the Kuching police, according to Tony Pua of DAP. We will keep monitoring this very disturbing trend by the law enforcers.